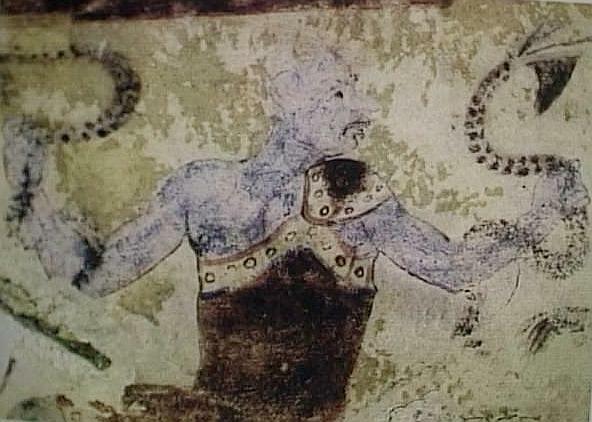 Inherited from medieval tradition, the devil was often shown as a snake with a woman's torso/head – something used by both Michelangelo and Raphael in their Vatican frescoes. There's a great post on this visual tradition here, a cryptozoology site. 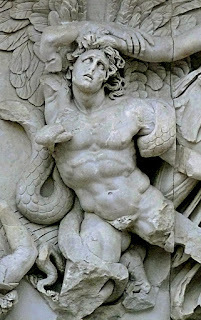 No real favourite snake image that comes to mind, but your post made me think of Poussin's "Man Killed by a Snake," which TJ Clark writes (AT LENGTH!) about in his Sight of Death book. Almost made me wonder how many cultures have been inspired by snake skins…. for decorative motifs, etc. Ugh, snakes. Like Indiana Jones, my bete noire is snakes. I can't bear to watch the intro for I, Claudius (or Black Adder II). No favorite snake art for me then. 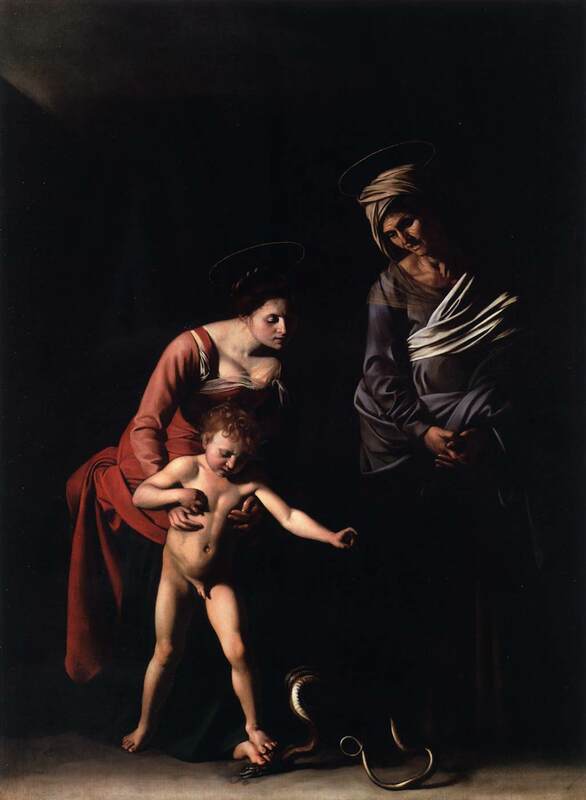 I'd have to say that I prefer Laocoon to Caravaggio's "Madonna and Serpent" because the Caravaggio is so graphic – the snake writhing off the ground is creepy. Like they say, you have to have a bad guy, and the snake is perfectly cast in that role. You've already touched on some of my favorites. 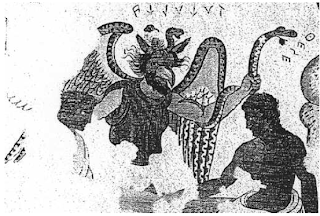 The second midterm in my survey 1 course this semester included a comparison of the Minoan goddess and the Laocoön! My favorite more recent work that depends on snake imagery is Blade Runner. I feel a blog post coming on…. Thanks for the comments! 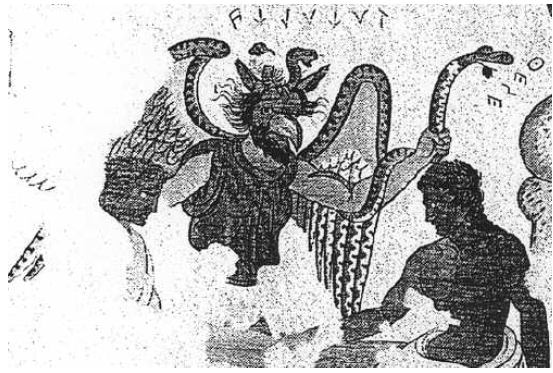 H Niyazi, I love that cryptozoology post. Those are some great images of snake-women. 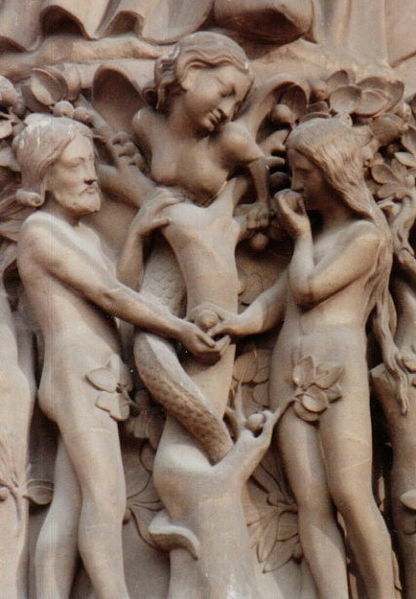 I especially like this depiction of the Fall from Notre Dame cathedral. 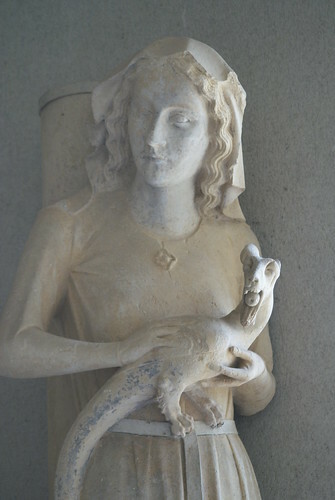 Along with this connection between women and snakes, there is an interesting depiction of Eve from Reims cathedral (13th century), in which Eve cradles and adoringly strokes the serpent. Ben, I wasn't familiar with Poussin's Man Killed by a Snake before your comment. What a great example of "snake art." Now I'll have to go and read what T.J. Clark said about it. Val S and dcbyron: I think it's funny that you both mentioned films with Harrison Ford ("Indiana Jones" and "Blade Runner"). Perhaps Harrison Ford has a personal interest in snakes? Even if that isn't the case, it's interesting to observe that snake imagery and themes extend to the world of cinema. Yes, Dandy, I didn't even mention the sexual associations with the snake. Kristin Lee Hostetler mentions this ideas as well (in the article I cited for this post), discussing how the snake is "analogous to the male member" (Hostetler, p. 203). 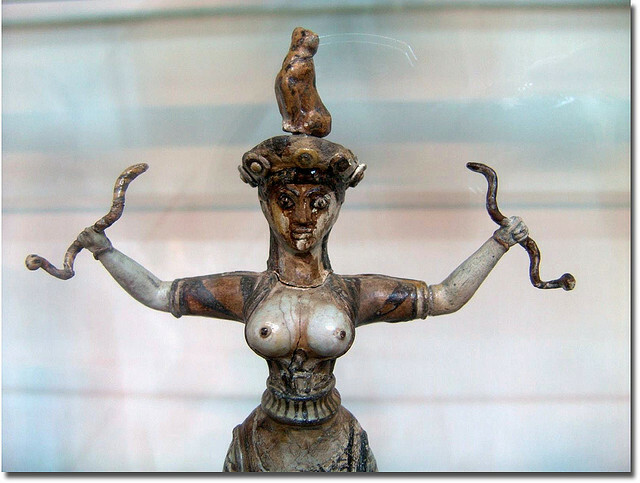 The phallic properties of the snake also explains why the snake is traditionally seen as a symbol of life and prosperity. 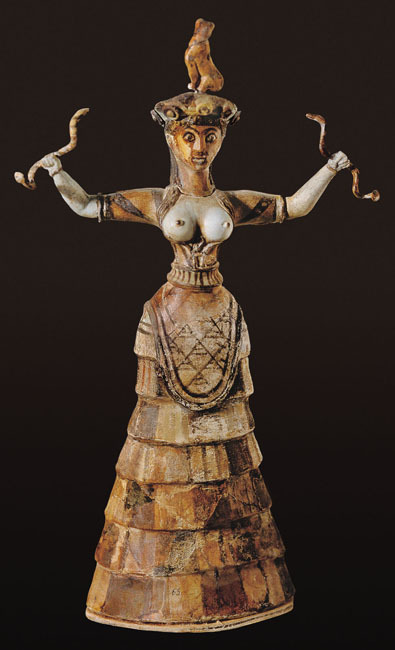 In one of my classes, someone wrote a paper about images of Medusa and connected their evolution to the development of matriarchal/patriarchal cultures in the Ancient Mediterranean. The image of the snake seems very tied to femininity, which I find interesting–you would think it would be a masculine symbol, but no. Kelsey, I like that you brought our snake conversation up-to-date with a contemporary artist. 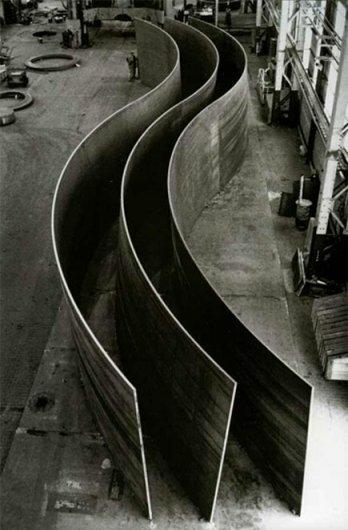 I love Serra's work. 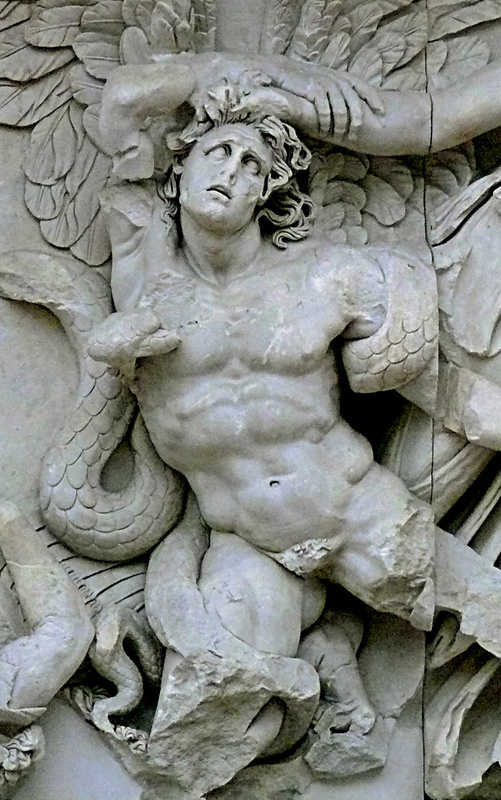 heidenkind, I was thinking about Medusa this morning. I agree with you: I think that snakes are often connected with females instead of males. And it is rather strange, considering how the snake has phallic properties. That being said, I wonder if there could be any psychoanalytical/feminist explanations for this connection between women and snakes?